Recorded by Grammy nominated recording engineer Rail Jon Rogut whose credits include Meshell NDegeocello, Ry Cooder and Michael Jackson. This Session Drummer 3 expansion kit was recorded via a classic Neve 80 series console, Sontec Equalizers and a Fairchild 670. Microphones used included Telefunken ELA M 251's on the Overheads and the Floor Toms, AKG C12A's on the Rack Toms & Neumann M49's on the Stereo Room. 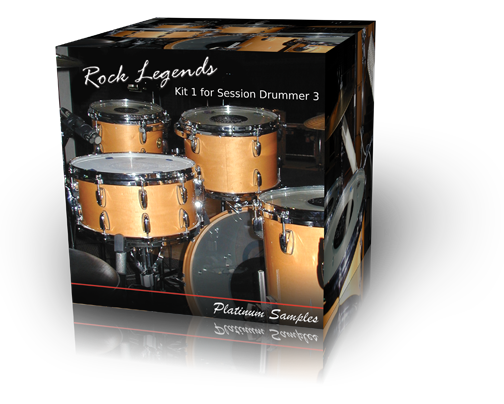 Available as two separate expansion kits or bundled together: Rock Legends Kit 1 is a natural ambient kit with a shank style Hihat. Rock Legends Kit 2 is a tighter, less roomy version of the kit with a different Crash 1, tip style Hihat and additonal EQ on the Kick, Snare & Toms with compression added to the Toms. Formatted for Cakewalk Session Drummer 3 and Dimension Pro in unprecedented detail with up to 16 velocity levels and 4 round robin samples per level. Cakewalk is a registered trademark of Cakewalk, Inc.
• This product is an expansion pack for Session Drummer 3, which is available exclusively in Cakewalk SONAR 8.5 and Cakewalk SONAR X1 Producer.